For over 400 years the predictions of Nostradamus have intrigued and perplexed the world. Many of his prophecies have come true. How many more will come to fruition? Few have studied this prophet as diligently as John Hogue, author of Nostradamus: The Complete Prophecies. 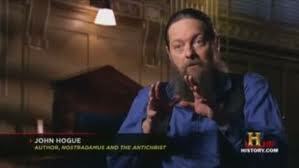 Hogue has spent 25 years researching Nostradamus’ prophecies. His new book, the most complete look at the life, writings, and astrological prophecies of Nostradamus ever published, is destined to become the standard work on the seer for decades to come. 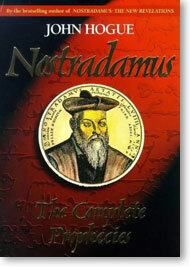 Nostradamus: The Complete Prophecies offers readers detailed biographical material about Nostradamus as well as a thorough explanation of the devices he used to encode his prophecies. Hogue presents the prophecies in the order they were written to facilitate the study of the prophet’s life and work. This new volume also includes Hogue’s interpretations based on 10 years of computer analysis of all 36,000 words of Nostradamus’ writings. The first complete examination of “quantum future” prophecies, or the alternative paths available to mankind, is also presented here. In addition, this book features an overview of the most notable interpreters of Nostradamus through the centuries and a detailed review of 20th century debunkers and interpreters. Nostradamus: The Complete Prophecies is the first full examination in 36 years of all Nostradamus’ 1,477 predictions and prophetic letters. It contains a number of innovations. The commentary will examine multiple future potentials of prophecies form interpretations set down in earlier centuries, to those of our time, and finally to those that speculate on destinies humanity may access thousands of years in our future. This will also be the most in-depth examination yet undertaken of Nostradamus’ epic prose prophecy letters, the Preface and Epistle to Henry II. Unfolding before you is a chronicle reaching far into the distant future, The “latter days” of our difficult era are used as a springboard into the coming peace and harmony of the Third Millennium. Then Nostradamus’ vision propels us even farther ahead to the destruction of Earth near the end of the Fourth Millennium. But the story of humanity doesn’t end there. Nostradamus is one of the few prophets in history to glimpse the coming galactic civilization of humanity. In my previous books I touched upon the theory that we might find the prophecies obscure or incomprehensible either because they are about events so far in the future that we can’t decipher their coding, or because they forecast futures we can never access because humankind’s free will has taken it down a different path of destiny. • What kind of king would Edward VIII have been if the British had accepted Wallis Simpson as his wife? Apparently a far better ruler than the current line of Windsors. • Did you know that Nostradamus foresaw the Anschluss not only of Austria but also of Switzerland into Hitler’s Reich? Is this a failed prediction? A close examination of the Nazi movement in Switzerland reveals just how close this prophecy came to fulfillment. • What if Rommel’s panzers had pushed the Allied invasion of Normandy back into the sea in June 1944? Strong clues in the prophecies indicate that the Soviets could have shaken hands with American GIs on the Rhine river rather than the Elbe! The Cold War’s iron curtain might have fallen between France and a communist united Germany, instead of a communist East Germany. • What if President Kennedy hadn’t been assassinated? Would the Cold War have ended 30 years earlier and forestalled the dangerous breakup of the Soviet Union? These and many other alternative futures will be examined along with hundreds of astonishingly accurate predictions for the centuries after Nostradamus’ death in 1566. In his progress through his future and our past we examine Christendom’s struggle with the Barbary Corsairs, the reigns of Henry de Navarre and Louis XIV, and the last words uttered by Louis XVI as the guillotine blade fell. We stare into the prophet’s oracular porthole in time to see and hear images of the English Civil War, the ascent of the United States, the songs and chaos of the French Revolution, and the evil destinies of three Antichrsits: Napoleon, Hitler and the third yet to threaten peace on Earth. We follow the seer’s account of many wondrous and terrible inventions, from radio, satellite dishes, and submarines, to the oxygen masks of “half-pig” men in their jet “air fleets.” We see him describe the atomic bomb, Hiroshima and Nagasaki, man walking on the moon, the Challenger disaster, the Reagan assassination attempt, the rise and fall of communism, and the fire and fury of cruise missiles in the Gulf War and in Kosovo. We look as well at Nostradamus’ visions of a future that is also our own. We are threatened with a Third World War that could start at any time from 1999 through the 2020s — a war we can avoid if we wake up and stop the population explosion and ecological degradation of this planet. In the next millennium humanity will recreate itself. Genetic revolutions will produce androgynous beings. Religions as we have known them will disappear. A golden age is coming. Paradise on Earth will last for a thousand years, then falter after the turn of the next millennium in AD 3000. Earth is destroyed by the expanding Sun in AD 3797. Long before and after this, the exodus of humanity into space will launch a second golden era. Human colonies will thrive ever after upon worlds orbiting the stars in the constellation of Cancer. Once we have encountered the complete canvas of Nostradamus’ 7,000-year history of the future, with all its dark and dire brush strokes, its all-too-rare flashes of human enlightenment — and after we have peeled off the layers of restoration by four centuries of commentators — we might better educate ourselves about all the intimate and detailed reasons why our history so far has been consistently a disaster in the making. The canvas is not finished. And it can be changed. By understanding Nostradamus’ chronicle of, as he writes, the “sad and prodigious’ events of tomorrows past and tomorrows yet to be born, we of the present day, poised upon the threshold of a new millennium, have the choice and ability to change our behavior. And by so doing we can direct destiny towards a future history of peace, love, and understanding. There are many ways readers of HogueProphecy keep us going. When you donate the time to read us, when you take the time to twitter about us or use our Facebook button to share articles with your friends, you are contributing a valuable resource of your time and interest. When you can send modest donations of $5 or more despite these difficult financial times, you sustain us. I would like to offer you a gift in return. If you can manage a generous donation of $100.00 (if living in the US) or $120.00 (if living outside the US) or $130.00 (if living in Australia or New Zealand), I would like to give as a gift in return a personally addressed message with autograph on the fore page of this rare volume. Reserve your personally autographed message and copy of this book by emailing me here. I will then contact you by email and send you the Paypal or Snail Mail address where you can send your donation. Mabus is Nelson Mandela, and the Ison are the two Sun’s clashing. And through the rituals and cloning of the DNA through the etheric body, which there is proof of, there could be clones, there will be hybrids with the aliens of the wrong kind to ensure that there can be no rebellion. THIS which writes this is microchipped through the etheric body and has become an alien parasite dispenser, as the eat off your aura – connection to God through every crack, especially the one’s of light, of the one’s which are ascending/receiving the holy Spirit. Just that all that should have been, is not, and all that shouldn’t have been – is. The gatekeeper gave away the key to the dark kabal, they wish through the law of God’s order, to inflict their own sin’s to be redempted by those who are of faith. The antichrist comes with a blue turban (cobalt blue being the color of Christ protection in energy) and the turban representing the muhammed-false prophet aspect, as what is foretold IS true because it had rejected God by messing with the Universe balance, of the above and below, yet IS NOT TRUE, because it was not of God’s true will. Vanga was right to about people/cyborgs. As the reconditioned/remaining part of the ego can say, FIGHT THROUGH INERTION! Your spirit is your way to freedom, things will not be fair now, it is not of God’s will, TRUST NOONE. Such unfairness then turns people rotten, asking why their God has abandoned them. Croatia falls, as it did not need to fall, but was manipulated as all prophecies need to be fullfilled, it’s the how’s and when’s which are of concern. It almost happened in the end of November 2011, but there was a divine intervention. The NWO which all fear is closer then you would think, as the gates have been open for two months now. It is spiritual slavery they want, for people to become so miserable that they enslave themselves physicaly. Fight by inertion! All hell will break loose with Ison, as the gates of heaven and hell are open at the same time. The worst thing about this antichrist is that it was perfection by God and remembers it, and through pride it is mirrored to the other side. Also, the sphere of Antichrist is of the dark kabbala, the illuminati few, as they now have the holy grail of Christs holy blood. Fast, renounce of cigarettes, additives, carbohydrates, alcohol, drugs and chemicals. keep your affairs at a minimum, and MOST IMPORTANT – HIDE IN SPIRIT. REMOVE all symbols such as crosses, icons, mandalas, stop using the names of God, as they now serve the wrong purpose and are being used to empower the wrong force, removing you from God’s light without you even knowing it. Consciously repent everyday for the blasphemy you did, and did not do, remove all soul ties from everyone except your children. Sincerely give away which ever it is you have prayed for and gained in the last 2 years, and then hide in spirit and close all portals, such as mirrors. Keep your lamb heart well protected, as you will be put in situations which will open up all your wounds. Deal with those asap. All is in reverse, mirrored, so is the one which was of God and by God, through mirroring, went off to the abbys. Is Obama gonna win this years election? Yes. The key is once again his electoral college advantage and more importantly the Republican ticket playing “white fright politics” alienating Latino voters, as I predicted they would over a year ago. Also, they have alienated the women vote. Thirdly, by picking Ryan, Romney has signaled his attempt to win the election by seducing the party base to vote for him. If he had chosen a more moderate running mate he might have won the real base one needs to win in these elections, the moderates, the Independents. But we will see. My oracle also predicted last year that this would be the most irrationally chosen president my my lifetime (I’m in my 57th year in this body). Maybe Romney-Ryan lies will win over Obama empty promises and grinning charm. That’s the real question. Which pretense will win? Who is the guy the people like better? Sad but true, that’s how we elect our presidents in the year of disheveled and ancient actors talking to empty chairs. Eastwood wasn’t “home”, the chair was empty. The American voter is also “not home” in his or her reasoning minds. One of his quatrains on global famine is indexed Quatrain 67. It may stand for (19)67, the year of the Biafran famine and civil war.